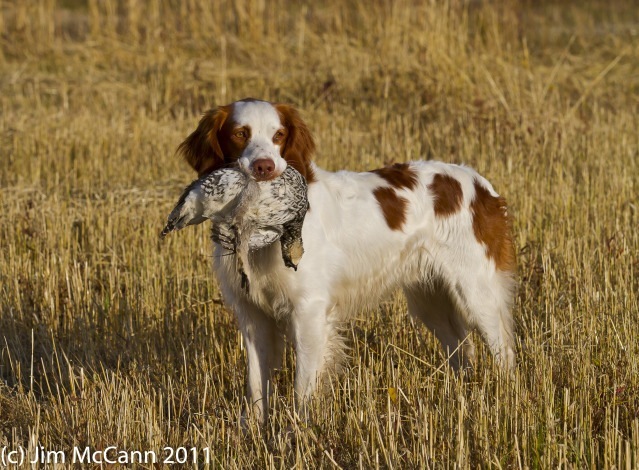 The first time I heard of Jim McCann, I was watching an episode of American Gun Dog with Harley Jackson who was hunting for late season ptarmigan with Jim McCann in interior Alaska. Harley described Jim as a “real Renaissance Man.” I thoroughly enjoyed this episode and was impressed with Jim’s Brittanies and the country they hunted. After all, upland hunting in Alaska has been on my bucket list for a long time. 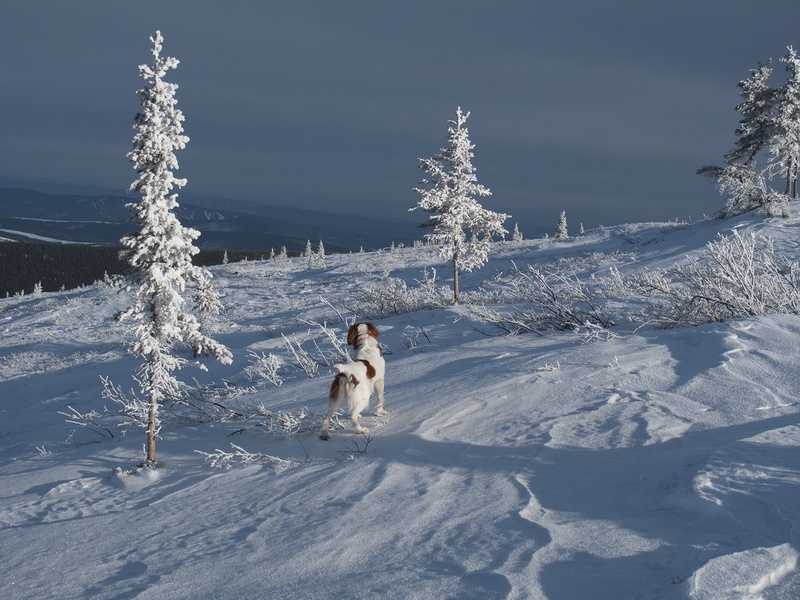 McCann’s dog, Charlie, pointing willow Ptarmigan in Interior Alaska. For me, social media is both a blessing and a curse, a curse because I waste so much time when I could be doing more productive things (like hunting, fishing, writing on this blog or writing another book) and a blessing because I have met some awesome people that I would not have otherwise met. Jim McCann is one of those people. I met Jim through a group Shawn and I started on Facebook called “Bird Dogs & Fly Fishing,” which is a fun group where bird-doggers and fly fishers come together and share stories, photos, recipes, artwork, writings, etc. In this group, we try to keep things positive and upbeat and the members have been just great. If you haven’t checked us out on Facebook, look us up and ask to join. Jim McCann with the bird of his heart, Ol’ Ruff. 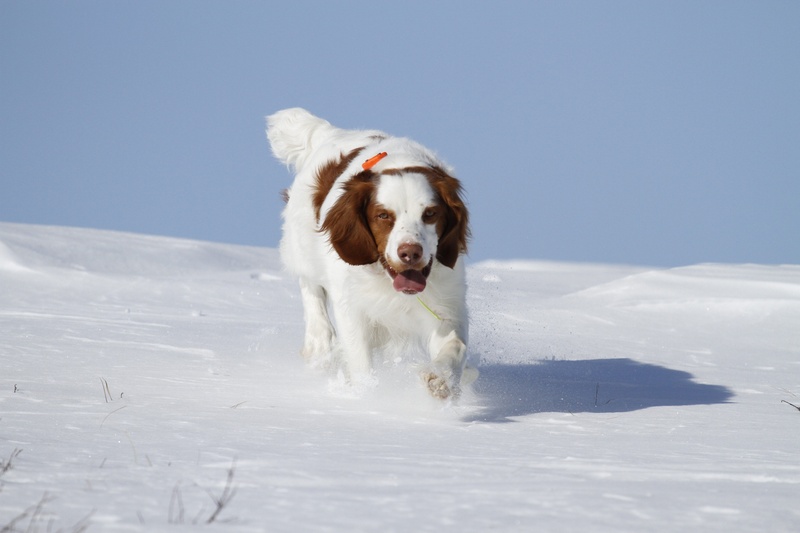 I first became acquainted with Jim through his great photography that he regularly posts on Bird Dogs & Fly Fishing, which includes pictures of upland hunting with his Brittanies in Alaska. 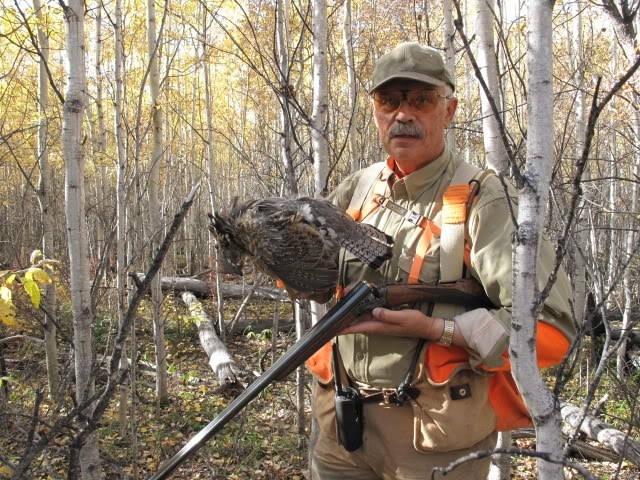 From his posts, I gathered that Jim loves Brittanies, and loves to hunt the noble ruffed grouse and sharptails, definitely a man after my own heart. 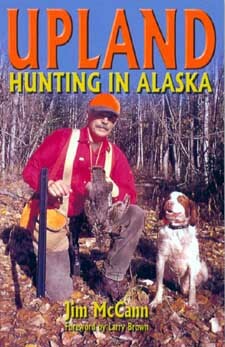 As I’ve come to know Jim a little more, I have learned that he is an excellent photographer, freelance writer, and author of the excellent book, Upland Hunting in Alaska, which Jim graciously allowed me to review. At the outset, I want to state that I am generally not a big fan of Where-to/How-to books. As I read Jim’s book, however, I quickly realized that this book cannot be pigeon-holed into that category. It is so much more! This really is the story of an avid grouse hunter and his bird dogs who happen to live and hunt in Alaska. While the book is packed with useful information for someone desiring to bird hunt Alaska, for me, the value of the book was in the stories that Jim tells of his dogs, the grouse, their hunts, and the beautiful, wild landscape they traverse. Rusty with a Rock Ptarmigan. If I could sum up Jim’s book in two words, they would be “Brush Worn.” For those of you who are not familiar with the term, a “Brush Worn” (as coined by the late George King) is someone who lives for the pursuit of the ruffed grouse with bird dogs and double guns in the Fall. Anyone who loves the ethical pursuit of the ruffed grouse will enjoy this book. It’s full of secret coverts, stanch dogs, successful and miffed shots, miraculous retrieves, and banner days afield. However, Jim’s book adds a few options to the grouse hunter’s menu including sharptail, ptarmigan, and spruce grouse. Charlie with a plump Alaska sharptail. 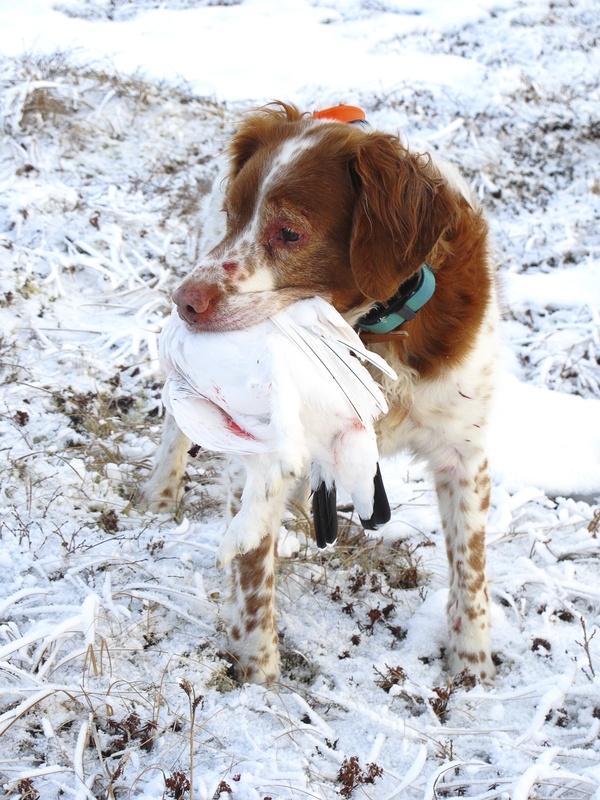 I truly enjoyed the stories of Jim’s Brittanies, Charlie, Buddy, and Rusty hunting grouse in Interior Alaska and related to his “MVD” award, which is the “Most Valuable Dog” award that he silently gives to the dog who hunts the best for the day. For Shawn and I, we call it the “A Team” and its always fun to see which dog makes the cut for the day. I laughed out loud when I read that Jim calls his 16 gauge side-by-side “the Arctic Cockatrice” because “it has served [him] so well.” I’ll just remind Jim that pride goeth before the fall! As a father of six kids, my favorite stories were of Jim taking his daughter, Haley, hunting. On their first hunt, Jim took a true double on spruce grouse, and afterwards Haley declares: “Daddy, you and me. We’re huntin,’ fishin,’ and horse ridin’ fools!” I could relate because some of my favorite memories are hunting with my own daughters. And who can forget the chapter of the time Haley got her first grouse and the earth shook? Good stuff, my friend! Charlie on his last ptarmigan hunt. Author’s Note: Special thanks to Jim McCann for permission to use the photos herein.